One and a half thousand years ago the territory of today’s St. Petersburg and the adjacent lands were inhabited by different tribes. They were Vod, Izhora and Korela. Then in the middle of the 8th century Slavic tribes came to these lands. In the 10th century these lands became part of Kievan Russia. The geographic location of these lands was very convenient. The major trade route lay across the Gulf of Finland, along the Neva and Lake Ladoga." That route was called “from the Varangians to the Greeks”.That trade route linked Northern Russia to South­ern and the Baltic lands and Scandinavia to Bizantium. In the 12th century Kievan Russia broke up. These lands became a constituent of the rich Novgorod Feu­dal Republic. From the 13th to the 16th centuries Sweden attempted to capture these lands. The Novgorodians tried to protect their lands. In 1323 they built the fortress of Oreshek. But soon this fortress was captured by the Swedes. In 1617 the Swedes constructed the fortress of the Nienschanz at the mouth of the river Okhta. Thus Russia was cut off from the Baltic Sea. The Baltic Sea was an important waterway leading to the countries of the Western Europe. 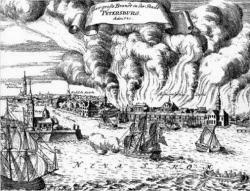 In 1700 the war be­tween Russia and Sweden for the age-old Russian lands, for an outlet to the Baltic began. We know this war as the Northern War.The Northern War lasted 21 years. It ended in 1721 with Russia’s victory. The beginning of the war wasn’t successful. But the fortress Noteburg (former Oreshek) was captured by the Russian Army on the 11th of October in 1702. In May of 1703 the important strategic point was cap­tured by the Russian Army. It was the Nienschants Fortress. “The window to Europe” was opened. And Peter the Great ordered to construct a fortress. The foundation stone of the city was laid by Peter I on the 16th of May (the 27th of May by new style) in 1703 on Zayachy island. The city began as a fortress and a port. Peter I decided to move the capital from Moscow to St. Petersburg. In 1712 St. Petersburg was declared the new capital of Russia. The new city went up very fast. Peter I ordered to build houses only along the streets according to the plan and not at random. The tsar himself supervised the construction of the new city. The best architects, sculptors and artists creat­ed it. And some 20-30 years later it could compare with Europe’s largest cities. St. Petersburg received the poetic name of “Northern Venice” by its remark­able architectural ensembles. At present St. Petersburg is one of the most beauti­ful cities in the world.